Do you get winged visitors in your backyard? I do, on my balcony. Pretty birds with feathers of brilliant colors are always a sight to behold. You can make friends with these unrestrained children of nature. And the best way to extend a hand of friendship, is by food. Birds love food grains and bird seed. You can scatter them across the ground or on the balcony ledge, but that just makes a huge mess for you to clean up later. So, what you can do instead, is craft a small bird feeder and hang it around in your backyard trees or your windows. Birds are quite appreciative of such small gestures. So even if you use recyclables or repurposed old material, you’ll definitely get a lot of winged visitors in your garden. 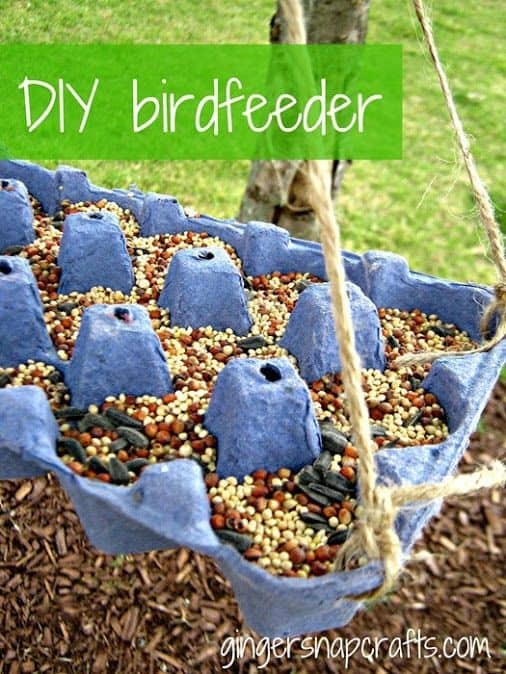 Check out some of these brilliant DIY Homemade Bird Feeders for an easy DIY bird feeder for your backyard or windows. 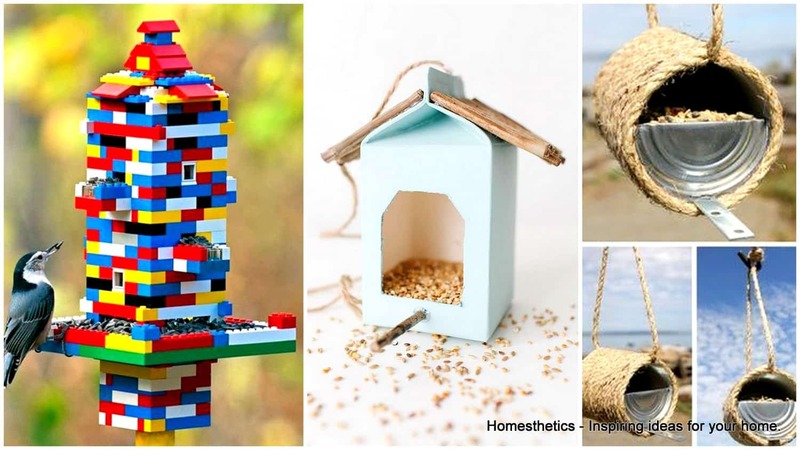 If you`ve found th DIY Homemade Bird Feeders below interesting we invite you to check various other free woodworking plans, we have curated lists that will show you how to build a cheap fence ideas, guinea pig cage, router tables, duck house, deer stand, bat house, tiny house, rocket stove, diy tree house, cat tower, garage, fire pit, porch swing, greenhouse, small cabin, farmhouse table, pole barn, rabbit hutch, diy dog bed, a playhouse, a pallet fence, a chicken coop, a coffee table or a gazebo. 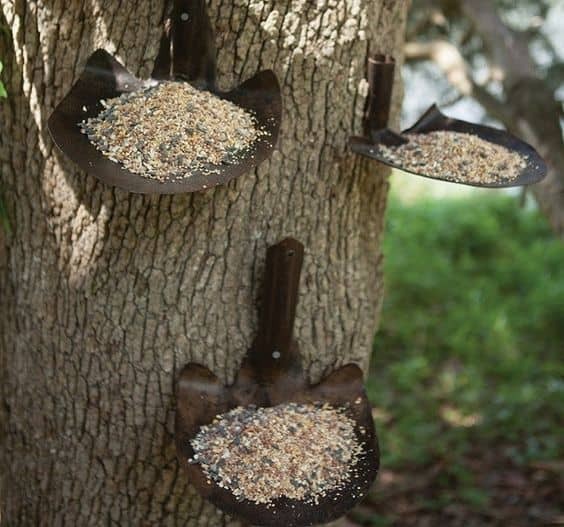 This DIY Homemade Bird Feeder adds an organic and natural look to your bird feeder, quite literally. It uses an old tin can, like the ones we saw above. Make sure to blunt the edges of the metal and fold the lid so the birds won’t be hurt. 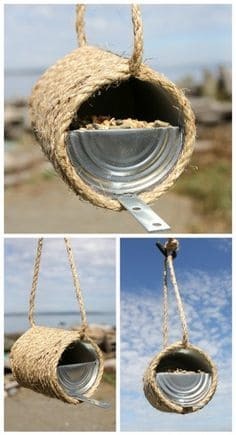 Tying a jute rope around the can will insulate the feeder for both summers and winters so that the birds can take shelter in harsh weather. It will be easier to hang the can too. You can get the jute or sisal rope in any utility shop, and for dirt low prices, so it won’t be an expensive project for your garden. We all wonder what to do with empty plastic soda bottles. We just reuse them and throw them away. Now we can control the number of plastic bottles we throw out, by using them to create a haven for little birds. These one-liter plastic bottles can be hung around your backyard or windows as bird feeders. 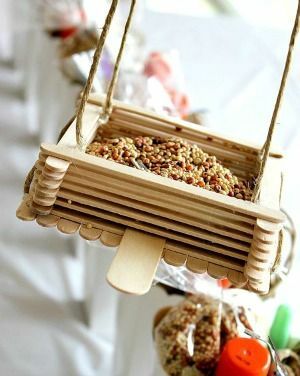 It uses wooden spoons to stop the bird seed from spilling out, and the handles of the spoon to allow birds to stand. 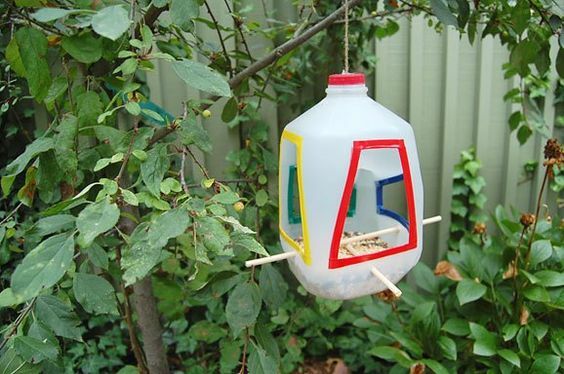 There are so many ways you can use a plastic bottle to make a bird feeder apart from the ones suggested above. 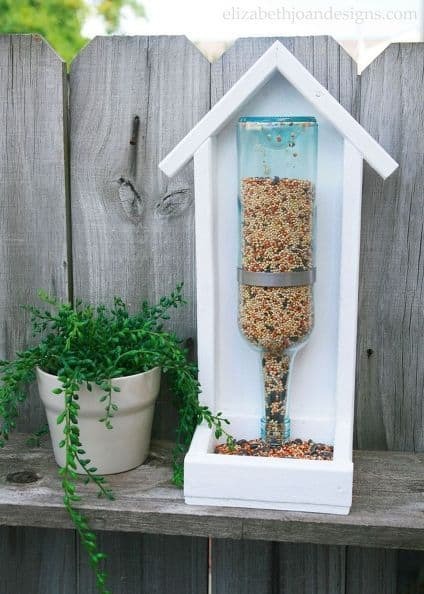 Like this bird feeder, which uses the same kind of bottles and adds a different twist to it. They made it look like a small cottage! The bottle is painted with earthy colors. And it has a roof thatched with leaves too. If I were a bird, I’d certainly like to visit this bird feeder doubling as a birdhouse. We used an upcycled milk carton for a feeder before; now this one uses a milk jug. The jug has large squares cut on its sides. They’ve taken extra care to tape it with colored sticky tapes so the birds won’t get injured. 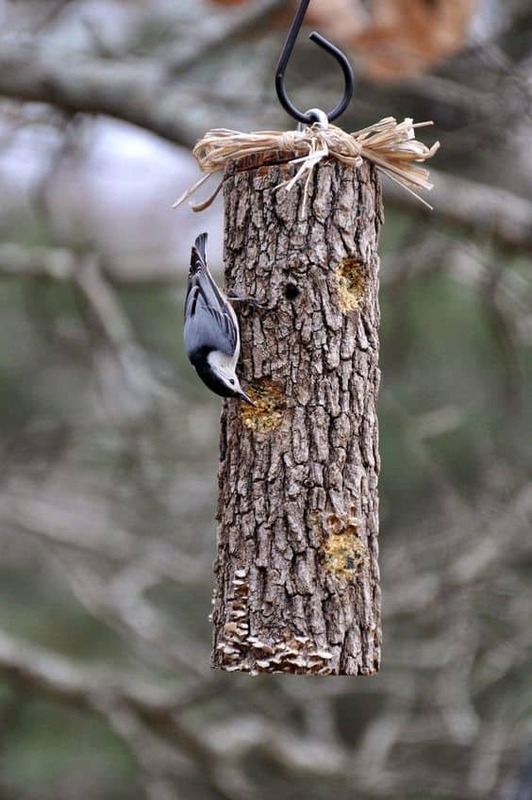 You can add sticks to the bird feeder, which is not really necessary, but can help birds stand and eat more easily. 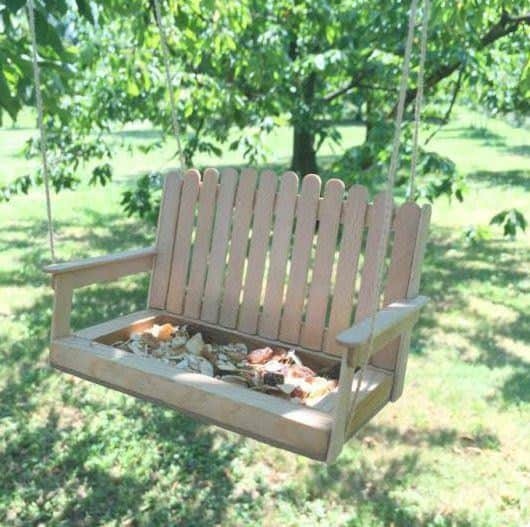 This upcycled bird feeder seems really neat. We saw some designs for plastic and wine bottles upcycled as bird feeders. You can also use a similar technique to use old soda bottles made of glass. 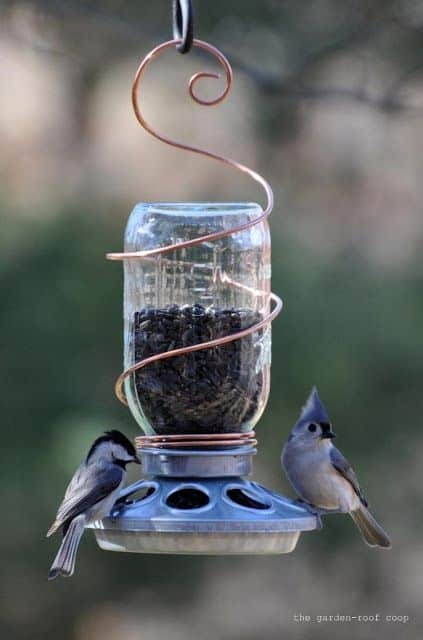 It’s an inexpensive and simple idea, but it works wonders for a DIY bird feeder. If you can’t find a soda bottle, you can use ketchup bottles instead. 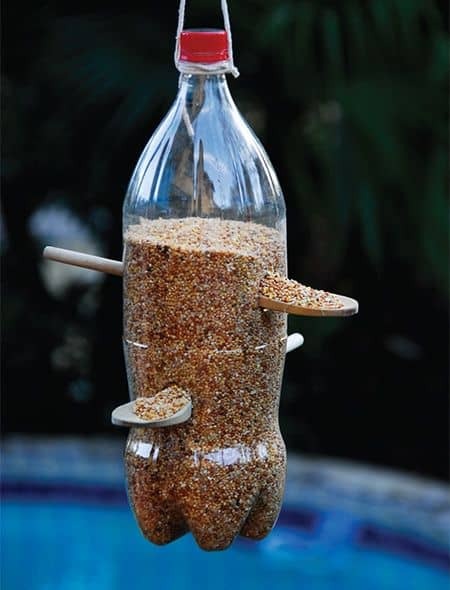 The best thing about making a bird feeder yourself, is the fact that you can use recyclable products from your household to make it. It’s a good way to make sure you’re not wasting resources or money. And the vintage look that it gives is just brilliant. 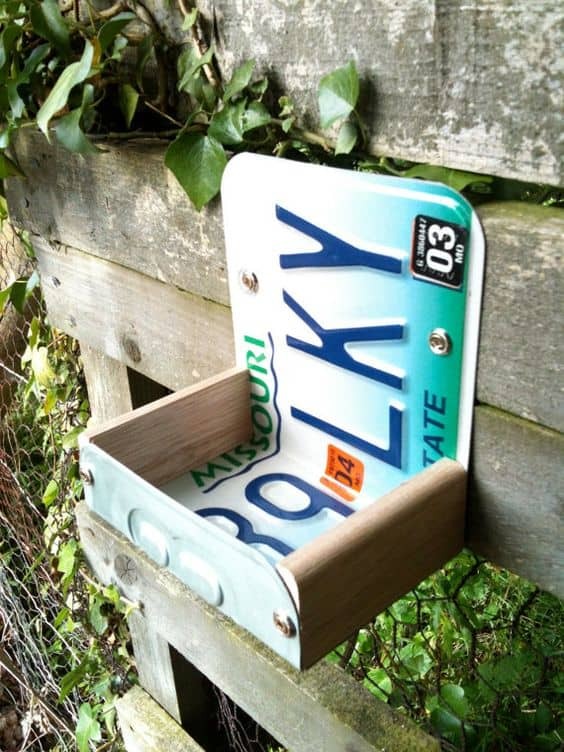 Like this bird feeder which uses an old license plate, some spoon holders and sardine tins. 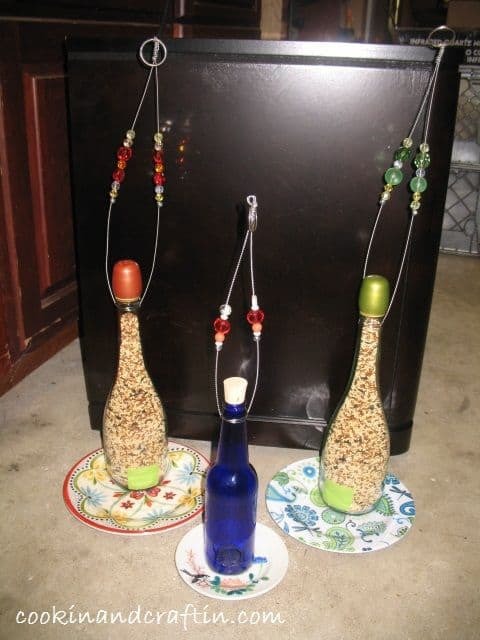 You can use old metal plates, wooden spoons, cans, and bottles. It’s really economic, and you get to try different ideas this way. 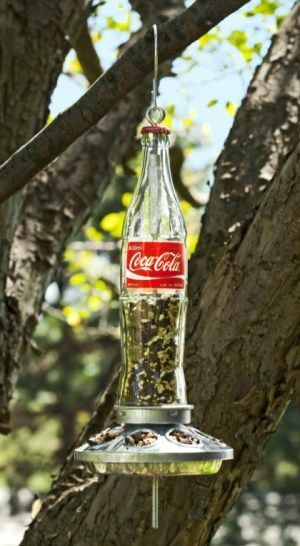 If you have glass jars which have been out of use, or jars which have lost their lids, you can repurpose them into a pretty bird feeder. 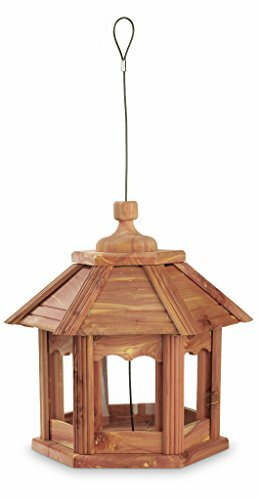 It will look nice in your garden or your balcony and will attract a lot of birds. The most efficient trait of glass jars, is that they are thick and won’t break on impact with supporting walls. They’ll also withhold the weight of many birds, especially if they’re suspended by a woolen yarn. So try this simple idea today. Paper made egg cartons can prove really convenient for purposes other than holding eggs. Like this nice little bird feeder. It’s so easy to make and hang around in the gardens and balconies. The best thing about this feeder, is that it can be done within a minute or two. Punch some holes in the corners of the carton and pull some ribbons through it. You may even paint it if you wish to. An amazing idea, isn’t it? Toilet rolls are essentially needed in every household, but we end up throwing the cardboard tube away. 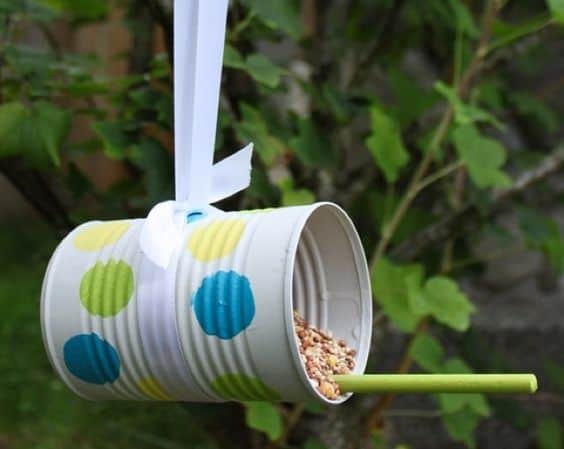 This tube has many uses in recyclable DIY products, like this nifty bird feeder. It’s not even difficult to make! All you need to do is coat the toilet paper roll tube with peanut butter and thoroughly stick a thick coat of bird seed on it. 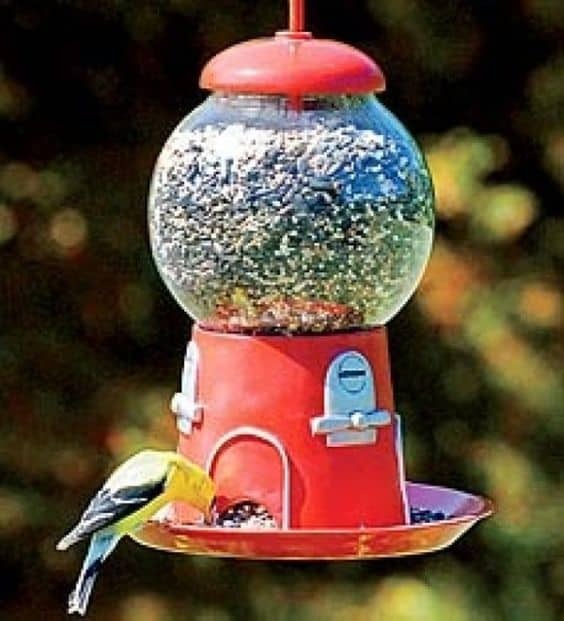 You don’t even have to decorate the bird feeders, and they’re easy to replace too. 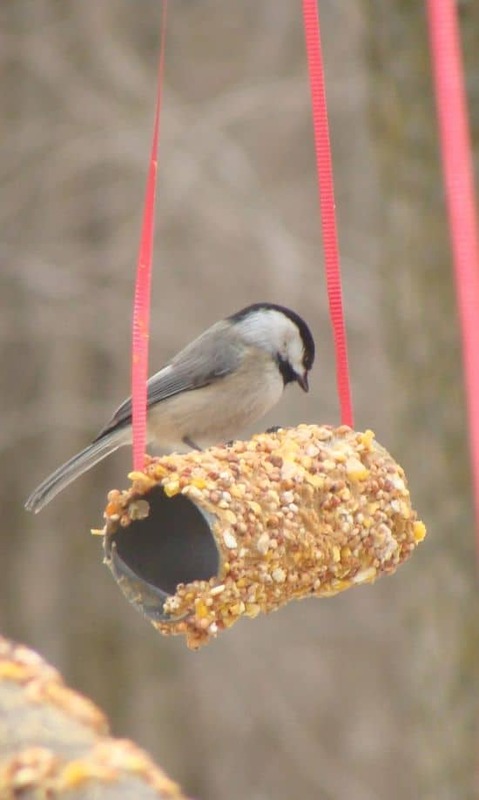 If you have some leftover PVC pipe pieces from an old construction or a garage project, you can upcycle it as a crafty bird feeder. 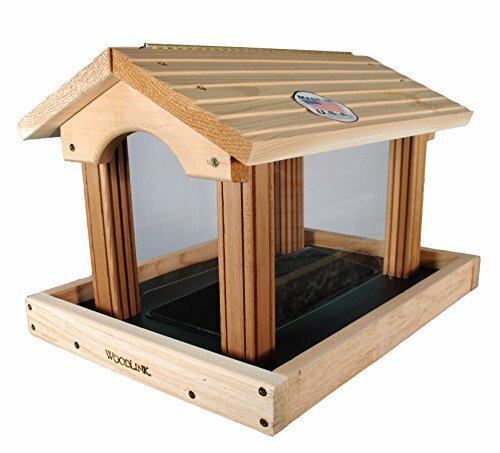 It holds plenty of birdseed, and you can control how much seed is released, by cutting a hole for enough spillage. You can fix the pipe to some old plates and make a stand and a roof for the birds. PVC pipes can be easily painted with acrylic and oil paints, so you can let your kids help in on the project. 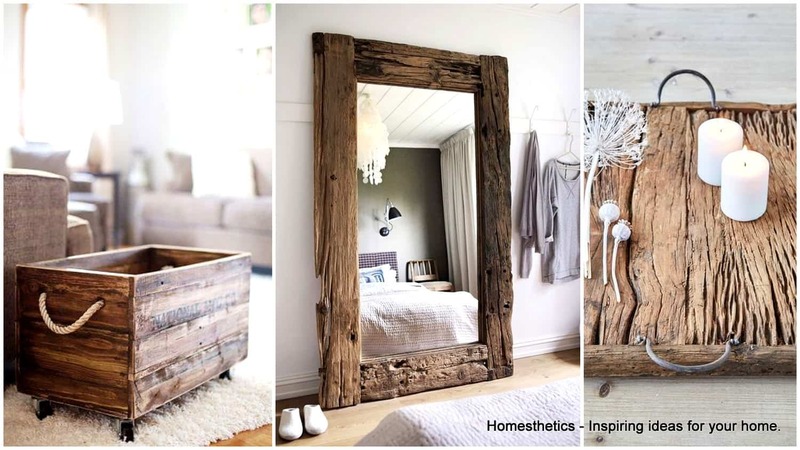 This is another organic idea that you can replicate. Making a small gunny sack, or in this case, a sock, as a bird feeder. You can get burlap fabrics in any store, or you can repurpose an old grocery bag for it. You’ll need to give it a few stitches, turn it inside out, and fill it up with the bird seed. The small holes are the burlap will give easy access to the birds to peck out seeds with their beak, and at the same time, keep the grains from spilling out. 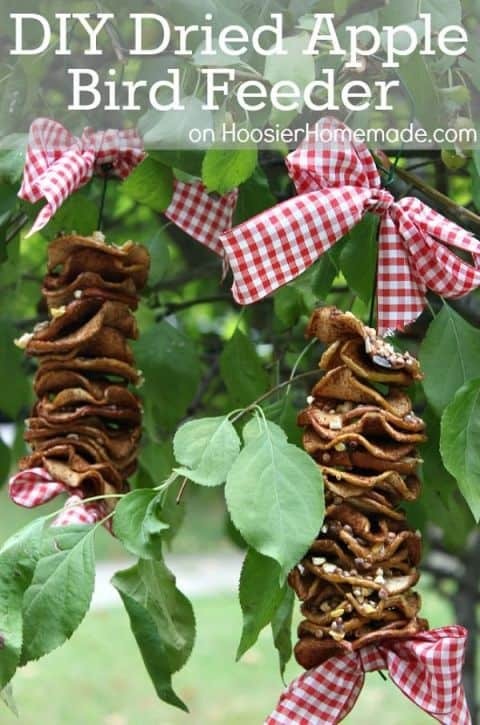 This simple little crafty idea is really good as a bird feeder. Since the surface of the dish is big enough, a lot of birds can feast from it. Using a disposable paper dish can make your DIY project easy. 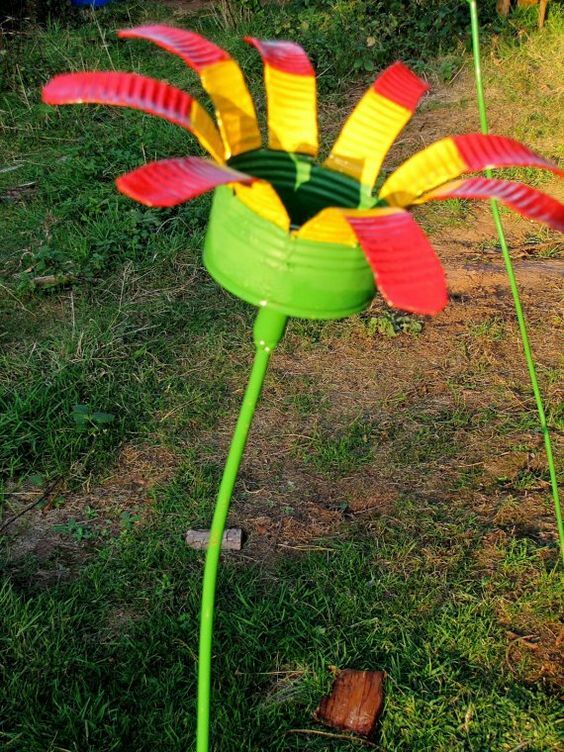 It doesn’t need any tools or fixing, so kids can make this easy bird feeder too. 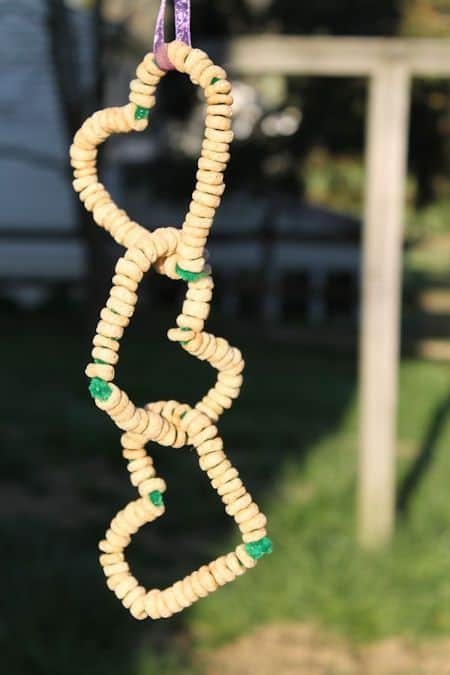 Using wired cheerio as a hanging thread is a really clever trick. It definitely adds some variety to the birds’ nibble. This DIY tutorial gives a step-by-step of how to build your standard bird feeder tower with stuff you can upcycle. 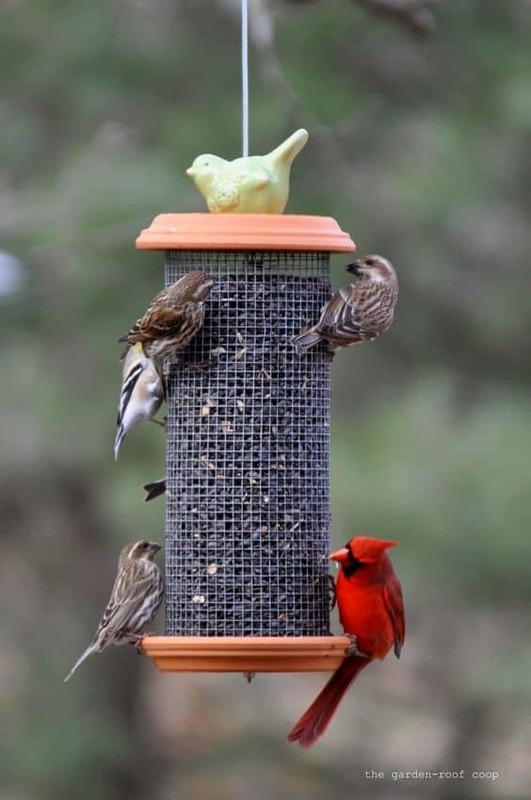 You can decorate the feeder in different colors too. Check it out in the link given below. 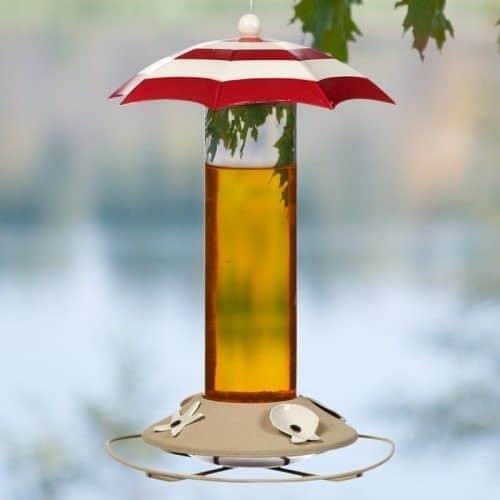 Now, this bird feeder is a top class idea for hummingbirds. It stores nectar in a glass tube, which has a small pretty umbrella for a roof. It seems like a place a bird would want to go on a vacation to. If you don’t have any way to make your own clay feeder, but the idea of using clay pots appeals to you, don’t hold back. 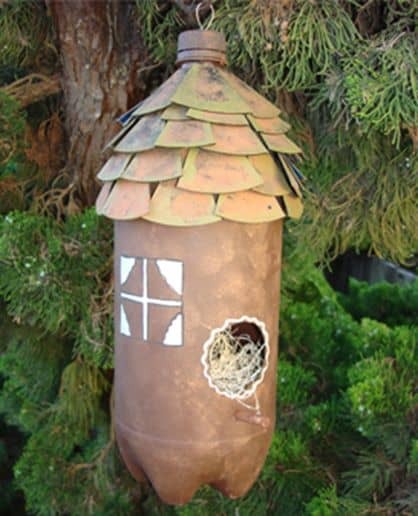 You can repurpose old flower pots or earthen clay lamps to spread a feast for the birds. You can use a drill to make holes in the pot for the seeds to fall out. You can even make a different pattern with the holes, like the one shown in the picture. Extra tip: Use a plastic bottle cap to reduce the impact of drill on the clay and keep it from cracking. When most of your old cups have broken off, and their saucers are left obsolete and useless in your kitchen cabinet, don’t throw them out. 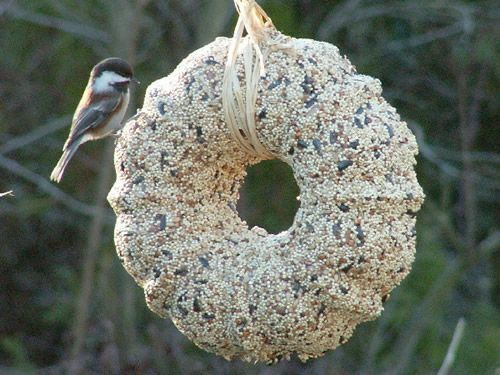 You can instead use them as simple bird feeders. Using straw or metal hanging baskets to hold the saucer in place with glue, will be a good idea, since you wouldn’t want the saucer to tilt and spill the bird seed. You hardly get old gumballs in toy stores now. So most of them have been sold off to thrift stores or recyclables. You can buy one of those to make a cute little bird feeder for your garden. The good thing about these machines, is their capacity to hold a lot of bird seed. You wouldn’t have to worry about refilling it time and again. Who would’ve thought using a gumball machine would be so convenient? If you have a lot of gardening tools in your shed which hasn’t been used in a long time, you can repurpose them as bird feeders. You’ll need to separate the shovel heads from their wooden handles. If there’s rust on them, you can remove it easily with some tips and tricks available online. Make sure you blunt the edges of the metal so the birds won’t get injured. 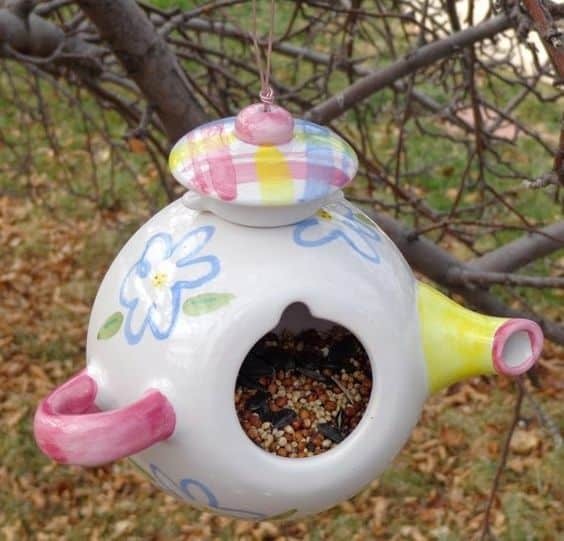 Fix them on a tree trunk, and you’ll have a brilliant repurposed bird feeders for your backyard. We’ve been seeing a trend of using old utensils for the purpose of feeding birds. This one is similar to the wooden spoon idea, but it’s actually an old soup ladle fixed to the wall. You can put a base to the ladle for the birds to stand on. 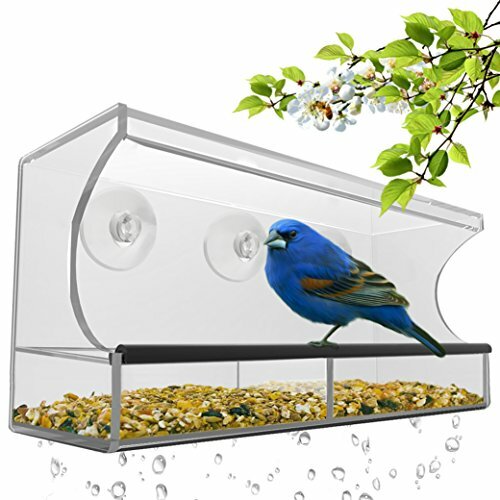 The shiny metal will certainly attract birds to your yard or balconies. We saw a cup feeder which looked like it spilled the beans. This one needs a little more craft skills as drilling through a ceramic cup and saucer is a work of patience. But the drilling is all you need to do. The cup acts a food holder for the birds, and the saucer acts as a shelter. 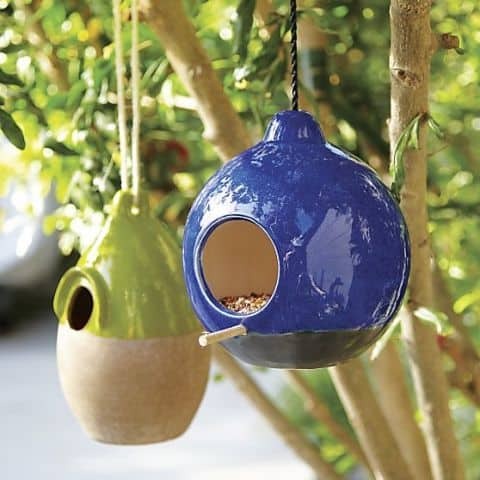 You can use peppy colors for the feeder by choosing different designs on your ceramic. You can also go one step further and add a cup for water. Like a cup and saucer, you can also use an old teapot for your winged friends. It can also double as a birdhouse during harsh weathers. Sealing the spout can prevent the bird seed from falling out. Teapots can be painted in very pretty colors, be it pastel, polka dots, or earthy colors. You can hang them around trees by their handles. It will surely add a new charm to the garden. If you live in a windy area, and are scared to suspend your china from a tree, you can use this alternative idea instead. The crockery won’t swing around and crash against any surface, so it’s a very safe option for both the birds and yourself. These tea cups are placed in a saucer normally, and glued neatly. 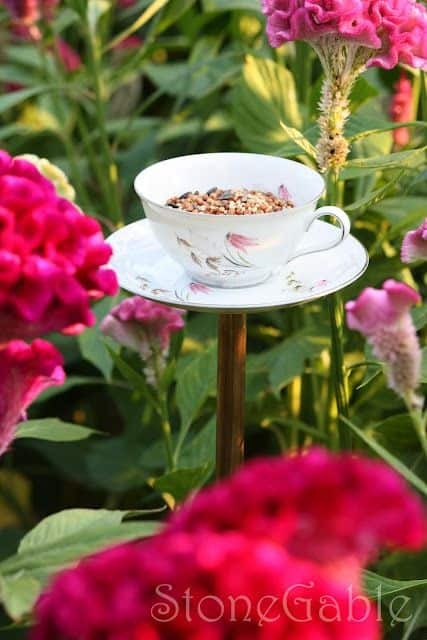 The tea cup will hold the bird seed, and the saucer will act a stand for the birds. The cups are then glued to a rod, buried in the ground. So your cups won’t break if you arrange them this way, and they’ll surely attract a lot of hungry birds too. Everyone loves Lego blocks! I do too, especially the best architecture kits envisioned by LEGO yet beyond kits with a specific end design, free-styling with LEGOs is the thing that started everything.There are so many things you can create with these colored blocks. 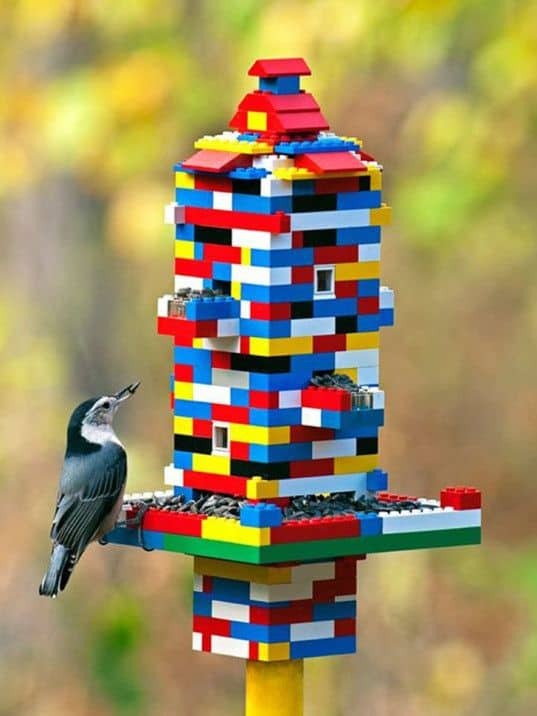 For instance, take this Lego feeder. Seems brilliant, doesn’t it? This is one of my most favorite ideas from the lot. The creator of this idea stumbled across this idea by happenstance. 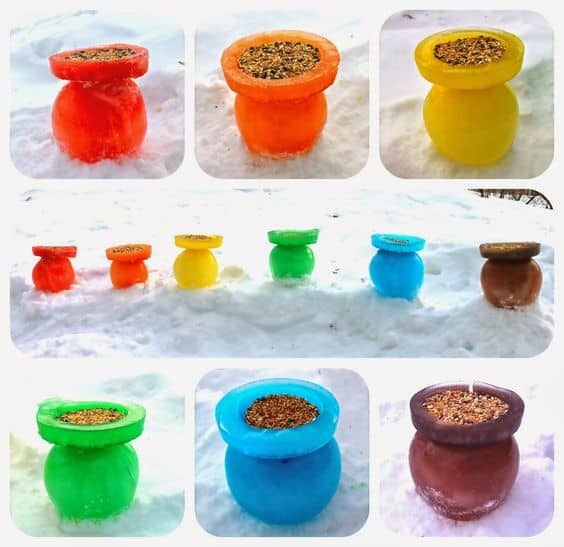 If you live in regions with heavy snow and frost conditions, you could surely try this idea to feed your feathery friends, and add color to your snow-clad white backyard. 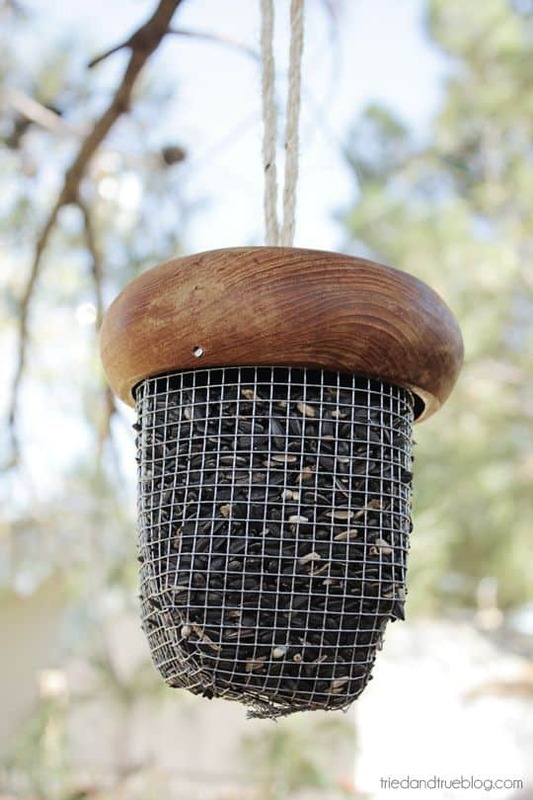 This is a really economic idea, and you don’t even have to create as many bird feeders. You just have to use some balloons, water, and some bright food colors. This will look quite brilliant on the snow canvas in your garden. And don’t worry, the ice doesn’t hurt the birds’ feet, so it’s a safe option. This one is quite simple for beginners. It’s a dry wooden log drilled and made hollow in random places. These holes are stuffed with the suet mix, and the whole feeder is hanged in the garden. 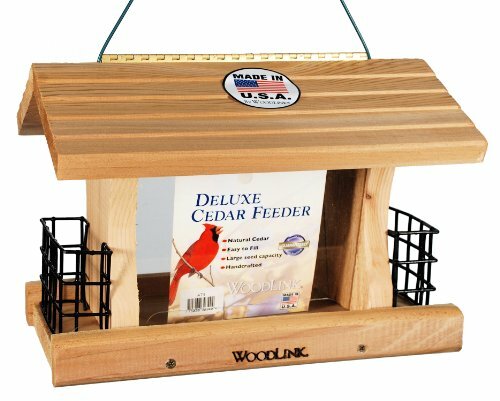 Now since this feeder looks like a natural log, a lot of birds take up to it immediately, especially woodpeckers. When the feed gets over, you can refill it with another batch of suet and hang it back. The birds will surely take a liking to it. You can easily buy a grapevine ball from a shop, and it’s not even expensive. You’ll have to pull some twigs apart to fill it with the suet, and leave it to refrigerate. You can hang it around the garden or balcony with jute or a sisal rope, and it will look completely natural. The tutorial gives some extra tips to hold the ball in shape as the twigs are thin and don’t hold the heavy suet weight. You can even stuff the grapevine balls with cheerios if you’re not interested in using suet for the mixture. 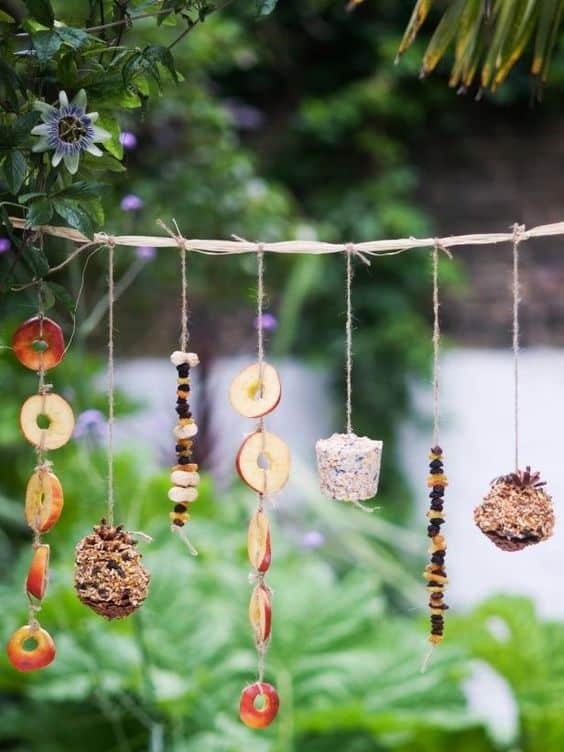 Hanging out different shapes of hardened suet will add extra beauty to your garden. You can use your cookie cutters to cut fun shapes into the suet layer. You can use a festive theme for the shapes, and it will look really pretty. For instance, you can cut star or gingerbread shapes and hang them for a candy cane for Christmas, hearts hanged by a pretty red ribbon for Valentine’s, or butterfly shapes for Spring and Easter. 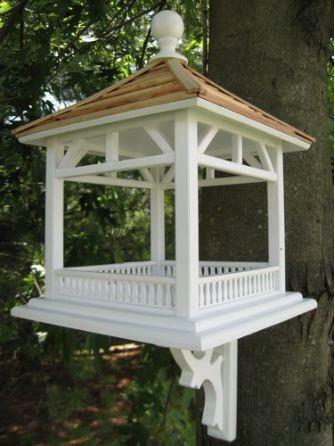 It is sure to attract the attention of the birds as well your guests during a garden party. Speaking of thematic and festive designs for suet bird feeders, you should definitely try this bird seed wreath for your door. It can replace your regular blingy green wreath and toy birds with something that’s homemade and organic. And you’ll even get real birds flying around your front door. You can find suet or gelatin recipes for a bird feed online, all you need is a bundt cake pan, and behold! Your very own bird seed wreath is ready to be hanged. Make sure to use fancy laces and ribbons for some extra color. This idea is quite clever. It’s shaped like an acorn using suet bird seed mold, wooden bowl, and a jute rope. The bowl acts as the top of the acorn, and the mold id fit into the bowl. You can put the jute rope through both the bowl and the mold, and then turn it upside down. Make sure you don’t attract the squirrels with this design though. 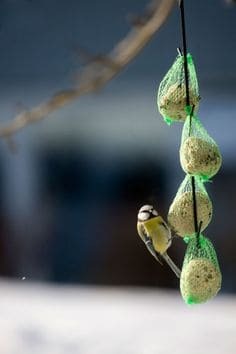 You can use mesh bags to hold refrigerated suet balls for the birds. You can readily get mesh bags from a grocery store. 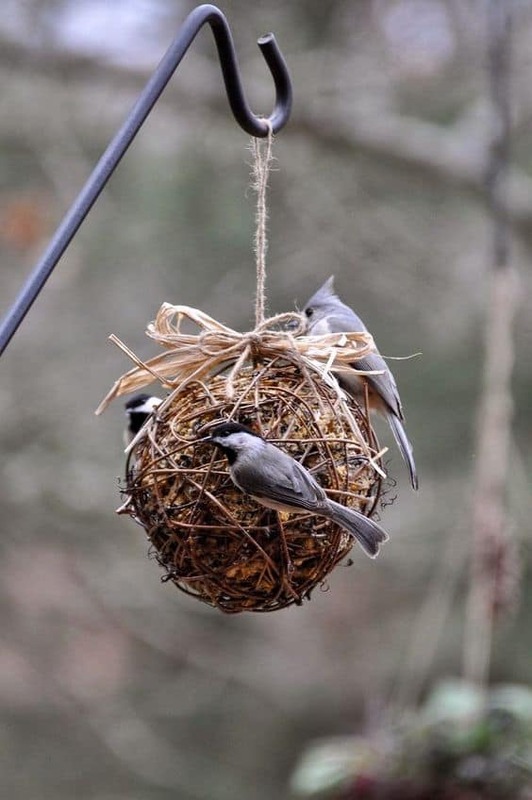 You can mold the bird seed suet mixture in spherical balls and put them in the mesh bags. You can add color to this simple craft by using different colored mesh bags. Using fancy ribbons and laces to hang them can take the boring simplicity away. 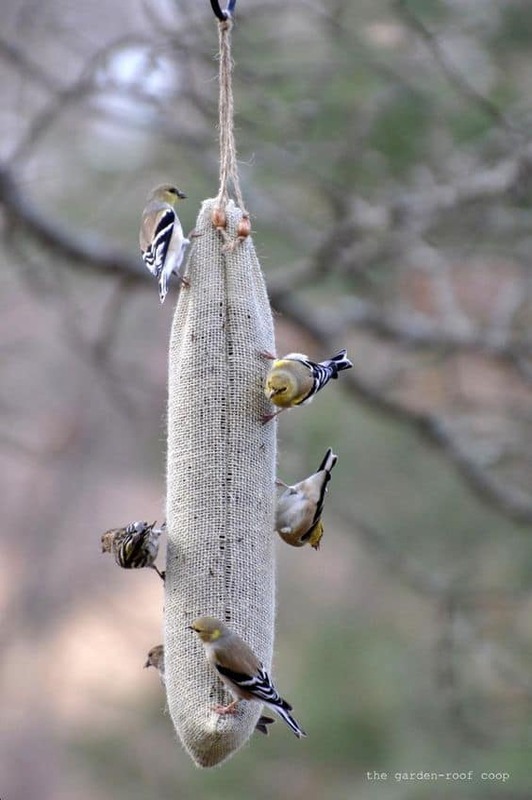 Watch the birds have fun flying around this simple mesh bag suet feeder. This idea is quite brilliant, and unbelievably cheap. 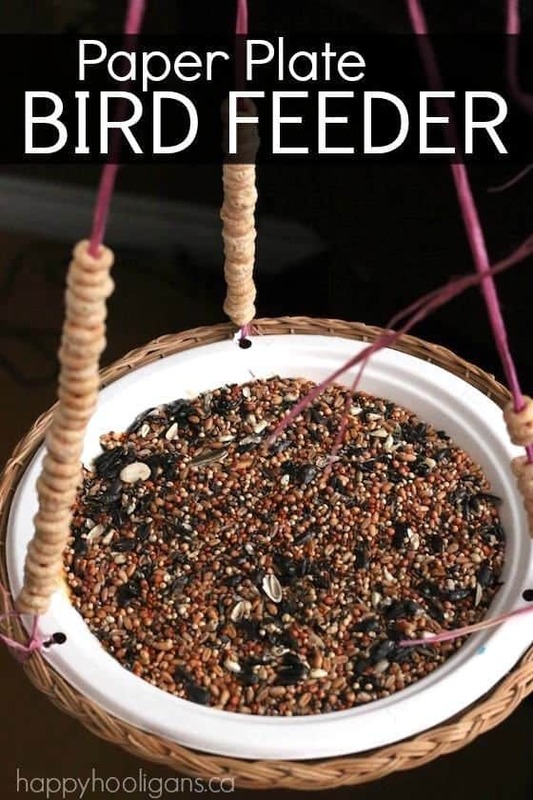 If you don’t have bird seeds available in your area, you can use a few of your Cheerios or cereal loops. It can hang around your windows and backyard in the summers, without any worries of breakage. You can experiment with different shapes, sizes, and colors, adding to the extra charm of a cheerio garland. An all-inclusive food buffet for your feathered friends! Fruits, nuts, grains and all! You can use threads to hand fruit slices – birds prefer apples and oranges – to attract birds. 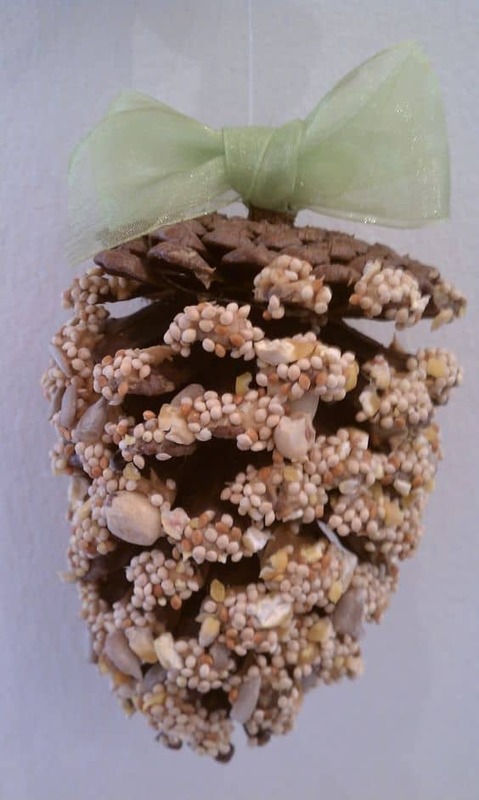 You can also include bird seed coated pine cones and nut threads in the garland. 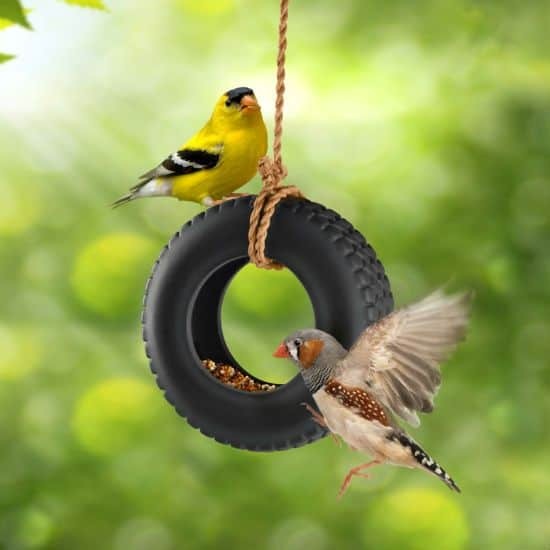 As much as it seems convenient as a bird feed, it also proves to be a very decorative piece for your garden. You might as well end up attracting some squirrels too. Leftover citrus fruit peels can be now used as a bird feeder. When you’re done carving the fruit out for juice, you can use these halved peels to store bird feed. Using woolen yarns to make holders for the bowl will withstand the weight of birds and the feeder itself. You can hang them around your garden or balcony, and it will still look pretty and beautiful. Pine cones naturally attract birds due to their strong and fresh scent. You can use them to attract hungry birds to your garden. You can pick the pine cones fallen around the trees or pluck some off the tree yourself. Coat them up with peanut butter and stick the bird seed on it, et voila, it’s ready to be hanged in your windows or garden. 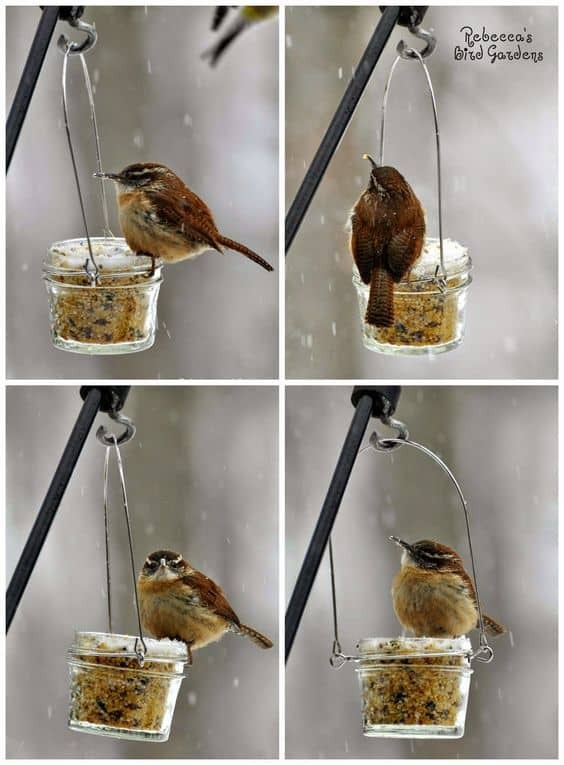 So, if you’re looking for a natural bird feeder, you can definitely try this idea. As mentioned above, apples are quite popular among birds. You can add fruit to their menu by including these sun-dried apples in their feeder. 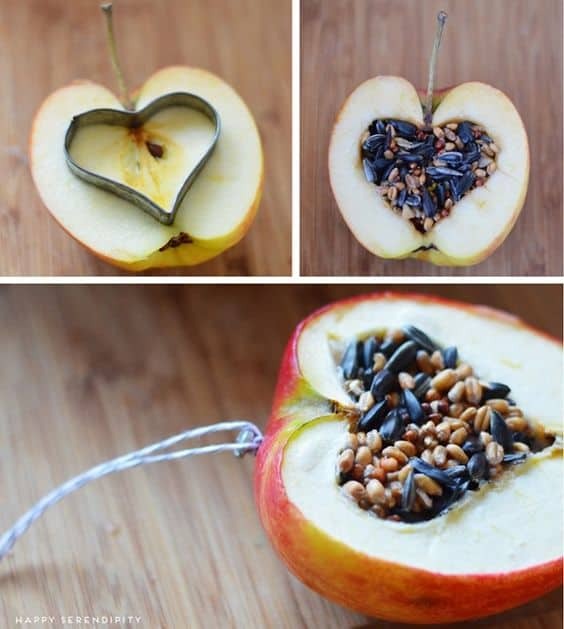 Apples are sticky too so that you can coat them with a thin layer of bird seed. Hang them up in your garden or balcony, and you’ll have constant visitors to your popular apple-and-grain buffet. The bread goes dry and stale quickly, especially in winters. But birds still love to peck on random bread crumbs. 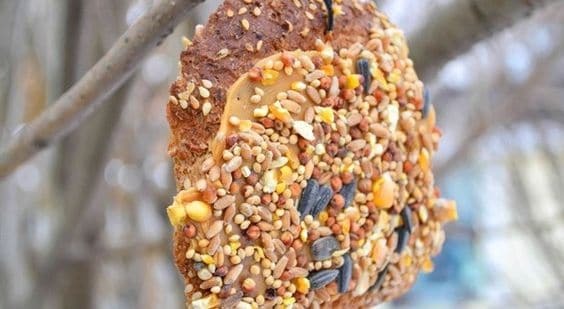 So instead of throwing away a good loaf of bread, you can prepare a winter treat for your feathery friends. Lather some bread with peanut butter on both sides and coat it with a neat layer of birdseed. Pull a thick wire or thread through the bread to hang it in your window or balcony. A no-waste product like this is sure to be a success. 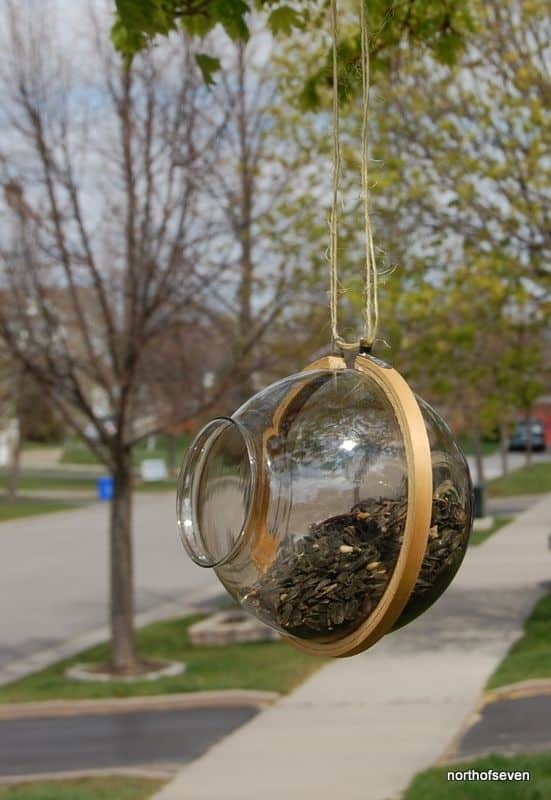 You can use a dried gourd or an empty coconut shell to make this hanging bird feeder. This is another best out of a waste product which isn’t expensive and reduces your garbage. Drilling holes in the shell will allow you to thread a wire through it and make it easier for hanging. 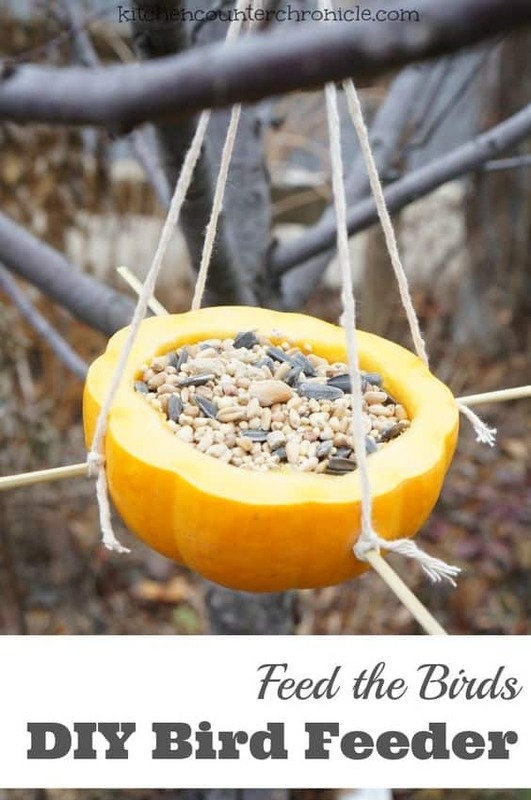 You won’t even have to throw the gourd seeds away as the birds will eat them up. Now that we know what fruits the birds love, we can use them as a bird seed holder. Like this fancy apple holder. You can carve different shapes with some cookie cutters. You can even use pears for this feeder. Filling up the carved space with bird seeds will certainly attract more birds, and they’ll be surprised to find a juicy fruity treat with it too! 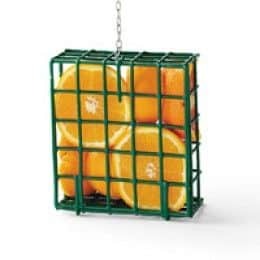 We tried a lot of bird feeders with apples; now there’s this nifty idea of keeping oranges for your winged friends. All it uses is an insulated craft wire or a spring, twisted and turned to hold the oranges. 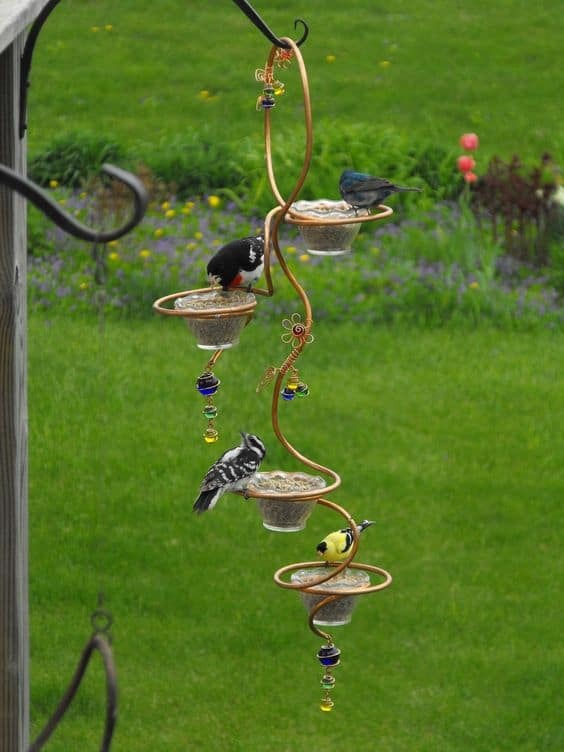 These bird feeders look like pretty charm bracelets. 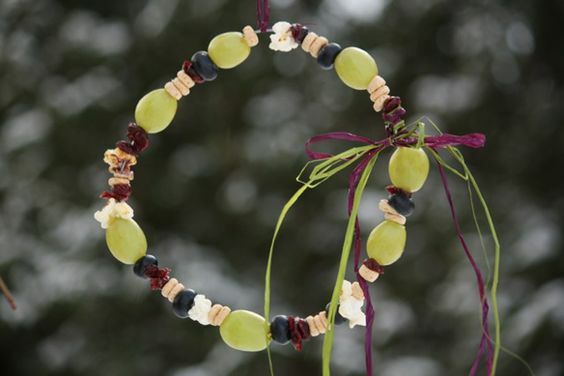 Sew some grapes, nuts, and grains into a thread and hang it around your garden. You can even add cheerios in them. I like the no waste approach to this idea – using up old fruit, or nuts with worms – it just reduces the garbage by a lot. 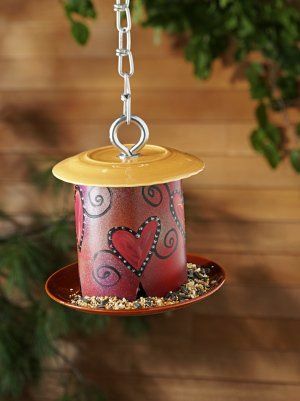 You can make multiple charm feeders and hang them around in the garden or your windows and see birds finish it up quickly. They’ll surely love the thought. Make your garden look special and festive in autumns with this cute pumpkin feeder. It will look especially festive with Halloween knocking on your door. So while you’re carving your jack-o-lanterns, use another pumpkin to offer festive treats to your winged visitors. 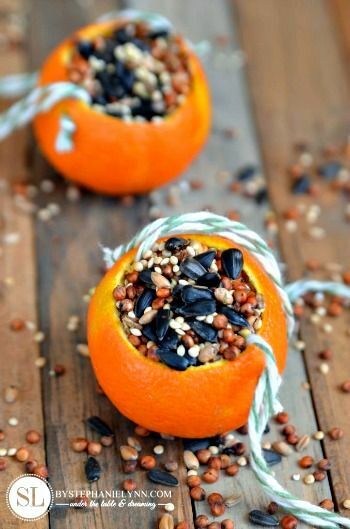 Carve the central portion of a dried or a fresh pumpkin and fill it with bird seeds. The birds will love that extra juicy taste coming from the pumpkin, and the idea will be a super duper hit among your guests too. 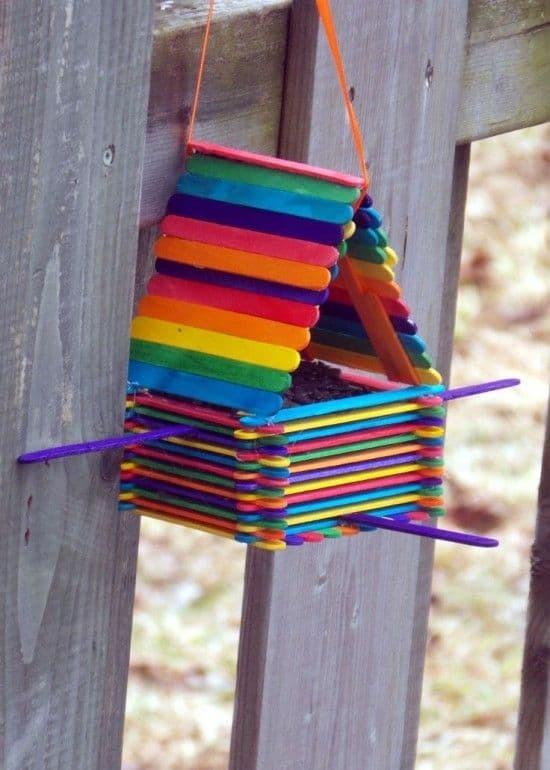 This bird feeder is pretty simple to make. All you really need is a mug that you aren’t using anymore or one you think is disposable enough to be repurposed as a bird feeder. 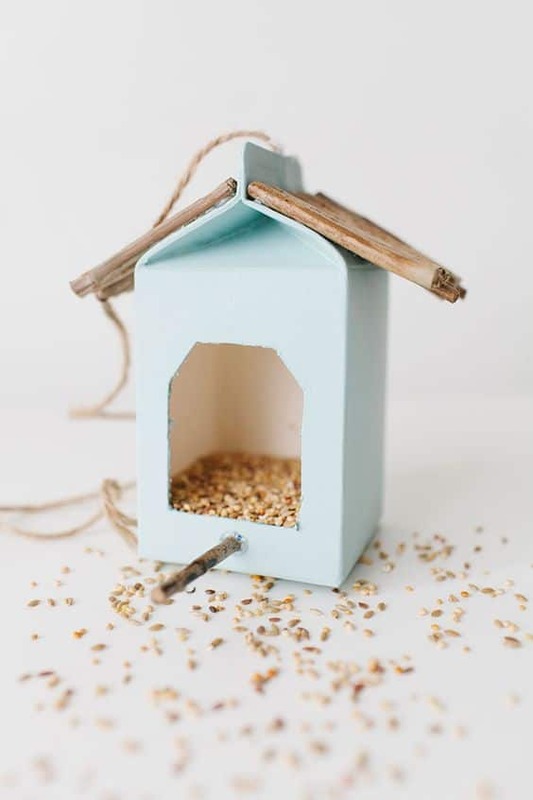 Fill it up with bird feed and milk and ready it to be hoisted by a wall or a door with a twig for the birds to perch on while feeding. 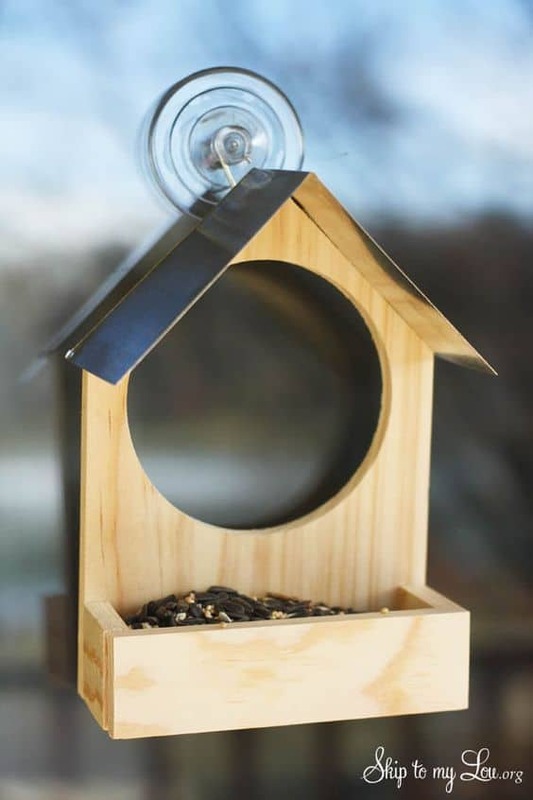 This how-to is more than about just one birdhouse for one bird feeder. This is a small township on the wall designed solely for your winged friends to rest in and to feed. 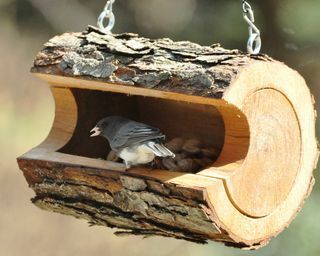 There are different types of feeders and houses in this birdhouse paradise. These wheelhouses made out of iron mesh are great for birds to both live and feed in. You can have either one or more of these wheelhouses for your tweety friends, and I’m sure they’ll appreciate the gesture! Upcycling is always fun. It does your job and saves on money and time. You are essentially recycling while giving upgrading the object’s purpose. And this bird feeder does the job gorgeously. 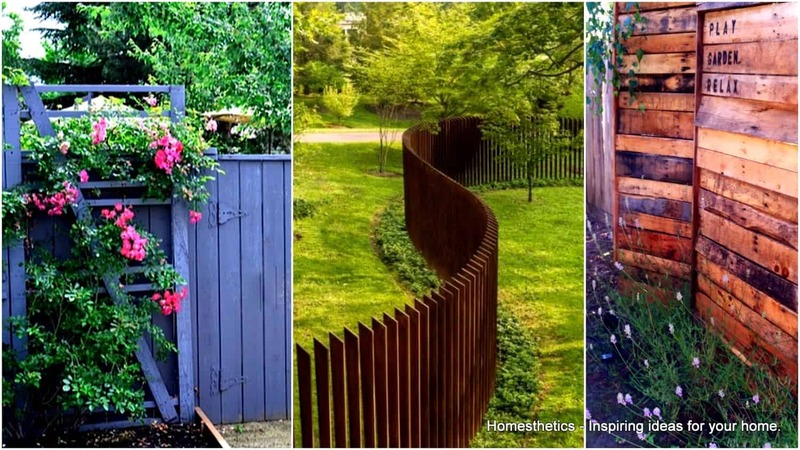 It looks neat and will be a welcome addition to your outdoors. Have an old chandelier you have no use for anymore? Don’t know what to do with it other than selling it off at the junkyard? 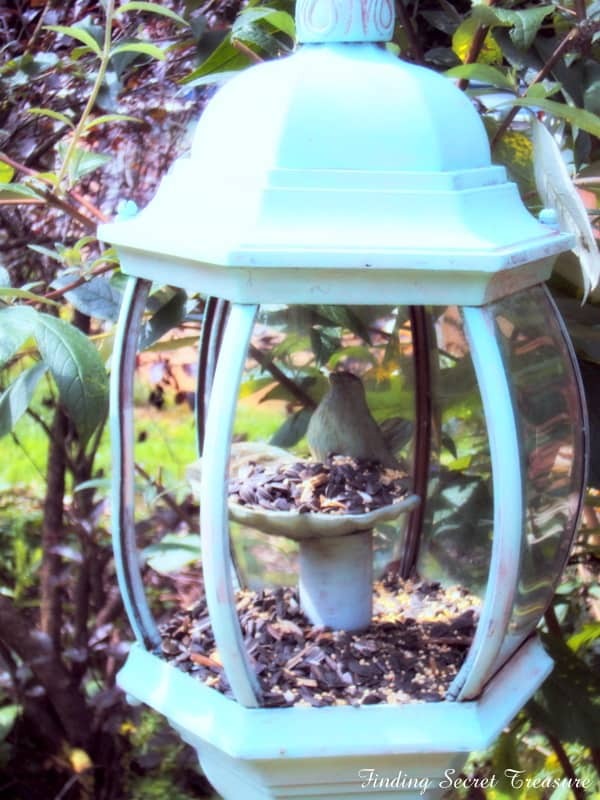 Here’s how you can help a lot of birds feed by repurposing it into a bird feeder. Sweet and simple and an odd yet creative decorative piece in your backyard to have. These suet baskets look adorable, and so do the little birds who feed on them. These are pretty easy to make and are very crafty to look at. Apart from being convenient feeders for neighborhood birds, these suet baskets also are quite ornamental. This is a repurposed piece of interior decor which looks more at home being a bird feeder. It has enough space for a lot of bird seed to be added and more on top for water. I’m sure the adorable little-winged creatures will like this arrangement very much! 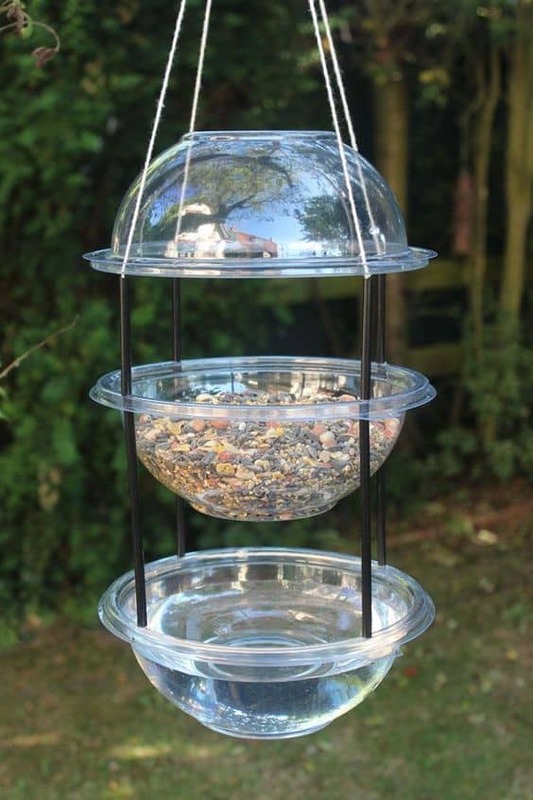 This bird feeder uses a recycled trash can lid and an old partitioned plate. The partitions help you segregate different types of edibles for the birds to feed on, and not only bird seed. Plus, you can use one of the sections for water instead of food. Pretty convenient and space saving. 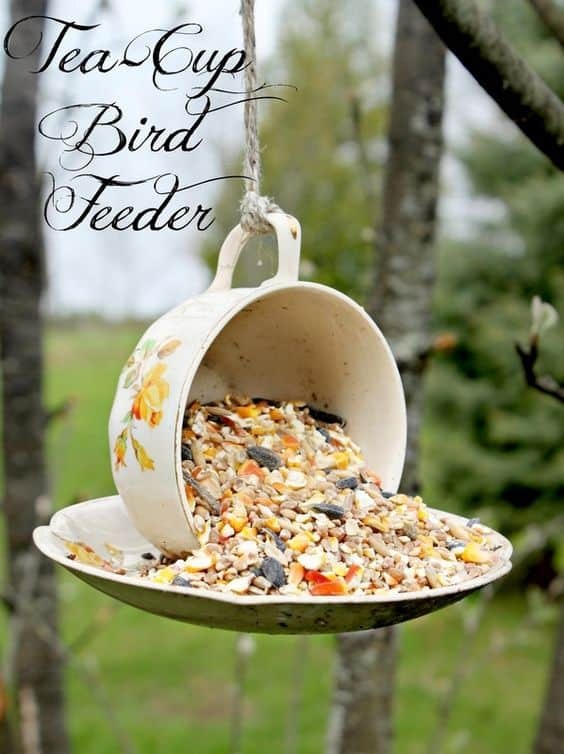 Here’s an assortment of bird feeder ideas for your perusal. Some are very simple, others a little more advanced, but all are satisfactory for your bird friends and lovely additions to your garden! 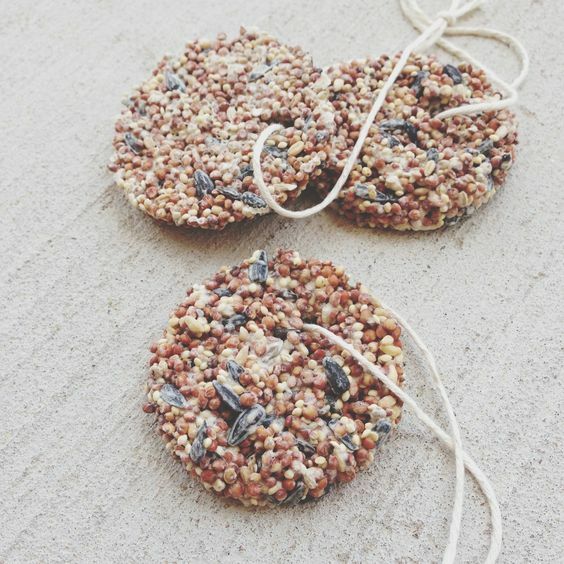 So did you find any DIY Homemade Bird Feeders ideas that were helpful? Did some ideas inspire you to try your own designs? Let us know your ideas too! 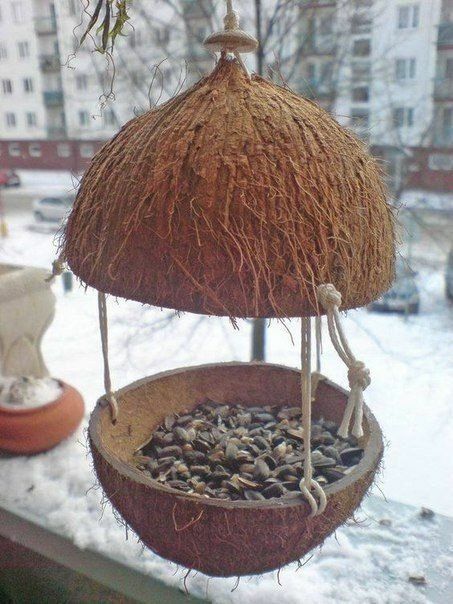 Good luck with your crafty bird feeders.